Chaos theory is a branch of mathematics focused on the behavior of dynamical systems that are highly sensitive to initial conditions. 'Chaos' is an interdisciplinary theory stating that within the apparent randomness of chaotic complex systems, there are underlying patterns, constant feedback loops, repetition, self-similarity, fractals, self-organization, and reliance on programming at the initial point known as sensitive dependence on initial conditions. 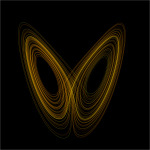 The butterfly effect describes how a small change in one state of a deterministic nonlinear system can result in large differences in a later state, e.g. a butterfly flapping its wings in Brazil can cause a tornado in Texas.